Making your own lightning rod is not impossible. However, it should be done carefully and with much consideration of cost. 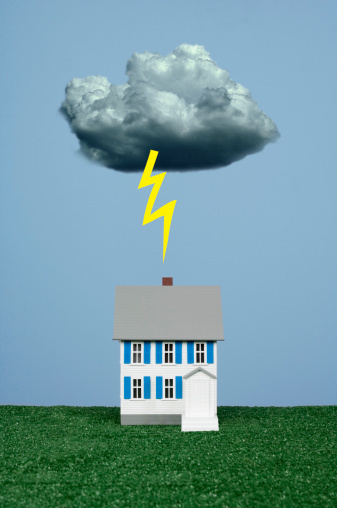 While it seems that a homemade lightning rod is cheaper, the cost of what the rod is protecting, and what may be lost if done incorrectly, must also be calculated. Follow your municipality's building codes for lightning rods for the safety of the structure and people. It is recommended that a professional installer do the job. However, you can make and install your own rod, then hire an inspector to check your work. Lightning takes the most convenient path. Place the 12-inch rod on the highest point on top of structure. Encircle the highest point of the structure with chimney straps and tighten with a screwdriver. Attach the lightning rod to the straps with a metal bracket and screw into place. Make sure all connections are firm. Use the screwdriver to attach one end of the cable to the lightning rod with a lightning rod wire clamp. Run the cable along the ridge of the roof and down the corner of the structure. Secure the cable in multiple places to the side of the structure with metal brackets. Dig a hole at least 8 feet deep. Place the 9-foot rod into the hole and bury the rod so that at least 3 inches of the rod is exposed. Use the screwdriver to attach the free end of the cable to the rod with the ground rod clamp. Cami Hines has written freelance intermittently since 2009. She has had several press releases published and has been published in Media Maison's online blog. Cami is currently a social media consultant for small businesses. She holds a bachelor's degree in business management and a master's degree with a concentration in marketing from University of Phoenix.